Home Big Event FABULOUS FALL CONCERT Sunday, November 4, at 2:00 p.m.
Sunday, November 4, at 2:00 p.m. The First Unitarian Universalist Society of Middleborough is presenting a concert on Sunday, November 4, at 2:00 p.m. This special concert features our historic 1890 Woodberry & Harris tracker organ, which was refurbished by the Andover Organ Company in 2014 with help from the Middleborough Community Preservation Committee. The guest organist will be Permelia Sears, joined by her husband, David, from Dunstable, MA. The Searses specialize in playing 19th century American tracker organs and have served as Co-Chairmen of the Extant Organs Committee of the Organ Historical Society. The organ selections have been chosen for this unique instrument and include works by Zipoli, Albrechtsberger, Bach, Barber, Alain, and Rheinberger. In addition to outstanding organ music, the concert will feature the 30-voice Chalice Choir, double bass player Nancy Kidd, and lively audience singing. 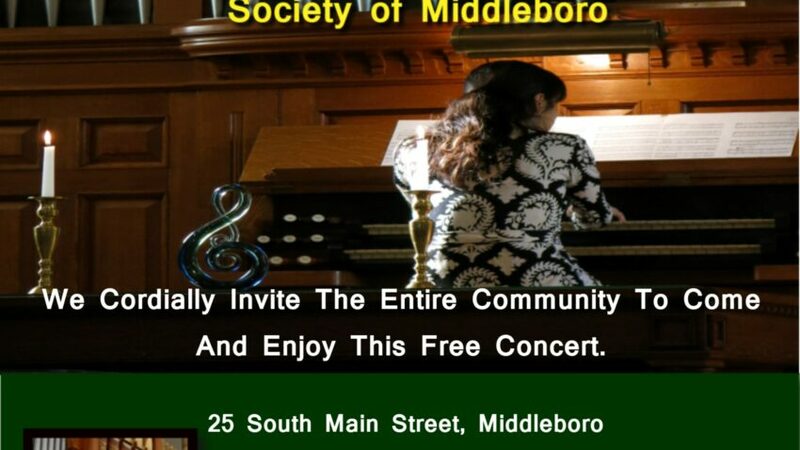 The music-makers at First UU believe that music transcends denomination and cordially invite the entire community to come and enjoy this free concert at 25 South Main Street in Middleboro. There will be a freewill donation basket to help defray costs, and a social time after the concert for refreshments and conversation. For more information, you may contact Susan Hotchkiss, Music Director, through the UU church office at 508-947-1935. Childcare is available upon request. Please note that November 4 is the end of Daylight Saving Time, when clocks move back one hour.